Since I created Offside Plays (@offsideplays) as a site to expose the everyday discrimination (e.g. racism, sexism, homophobia etc.) that takes place in sport and exercise nothing has caught my attention more than the harassment that women face while biking. The comments and cat calls that women receive while running and in the gym just make my eyes roll but, maybe because I don’t bike, I am consistently surprised by the amount and type of harassment/abuse faced by women on their bikes. One would think that the faster speeds that one travels on a bike would make it harder to be a target of harassment. Wrong. One would think that because it is dangerous to unexpectedly touch people while biking that would lessen the likely hood of harassment. Wrong. Going through all of these tweets I remembered that I was harassed while on a bike at the age of 14. It was such a long time ago and an aberration in my life it didn’t seem like a big deal but now that social media enables me to see these comments everyday it seems that no woman is safe. I had wanted to play tennis with a friend but she had a family outing to attend. At that time, I was determined to become a professional tennis player (wasn’t gonna happen) so I decided that I would go and hit on the wall by myself. I hopped on my bike with racquet strapped to me. About half way to the court (only about 10 minutes by bike from my house) a young man started following me in his car. He pulled along the side of the road and immediately the red flags went off in my head, all those lectures from parents and teachers about girls needing to lead a cautioned life. I turned the corner and he followed. I peeled into my friend’s cul de sac in the hopes that he would leave me alone. I rode right up to my friend’s house and he pulled his car right in front of the house and started making some obscene gestures. My friend’s dad opened the door and all I said was “Hi! That guy is following me.” He looked over my shoulder right at the car and Mr. Obscene tore out of the cul de sac. My friend’s dad drove me home with bike in the trunk and my parents reported it to the police. I left out the part about the obscene gestures. Nothing ever came of the police report and I never went to the tennis court by myself again. Here’s what I think is ironic – historically bikes have been integral to the women’s emancipation movement. 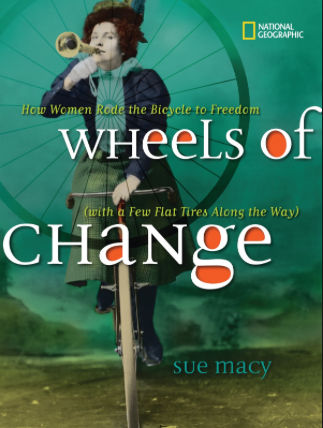 During the 1890’s, when bikes were all the rage, the combination of the Suffragette movement and the bicycle changed the lives of women in the United States. In 1896, Susan B. Anthony told New York World that bicycling had “done more to emancipate women than anything else in the world.” The bicycle became a tool and symbol of both personal and political power. The early designs of the bicycle were hard to propel and steer but when the safety bicycle was invented (chain power and equal size wheels) it meant that both women and men could move about independently. The bike helped the women before us experience freedom and represented equality, yet with the street harassment experienced by women today the bike is almost symbolic of violence against women. Last year the Washington Post highlighted this issue and quoted one woman as explaining, “As a woman, [she] is constantly operating with the low-level fear that any man might attack [her].” Sadly, women can be harassed while walking, running, biking or driving, but it is unfortunate that a technology that was so pivotal in the emancipation of women in the late 1800’s has, in many ways, lost some of its power and put certain confinements back in place. If you have cycling harassment stories to share please feel free to send them to @offsideplays on Twitter or post them to the Offside Plays Facebook page.